The purpose of this meeting was to select the genes that will represent the birth of the community in Córdoba, from which the model will began to become an inevitable reference in the market. With the presence of over than 50 specialists, the event was held downtown in the conference room of Windsor Hotel. There, GeeksHive MKT director, B. Psy. Victor Enrique Cáceres explained those present how the model works and its benefits. 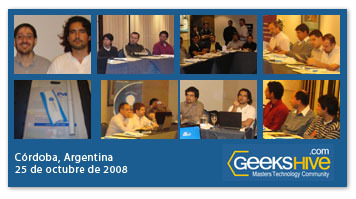 Afterwards, it was opened a debate in which the community founders Sebastián Borrás and Sebastián Monzón participated to dispel doubts. On their arrivals, specialists got a merchandising kit of the trademarks that make up our community. Finally, they could enjoy a coffee break at the end of the event and continued learning about the model. This week, specialists interested in continuing the selection process will be interviewed individually. Then, whoever passes the evaluation will have to take the technical test about extranet use after being directly trained by Sebastián Monzón on November 1.